Decca is founded by Mr. C. H. Tsang, Chairman and Managing Director, together with Mr. Edmund H. K. Liu, the group's Deputy Chairman. Operating with fewer than 30 employees, Decca originally supplied and installed furniture and architectural woodwork as a subcontractor for a local interior works company. 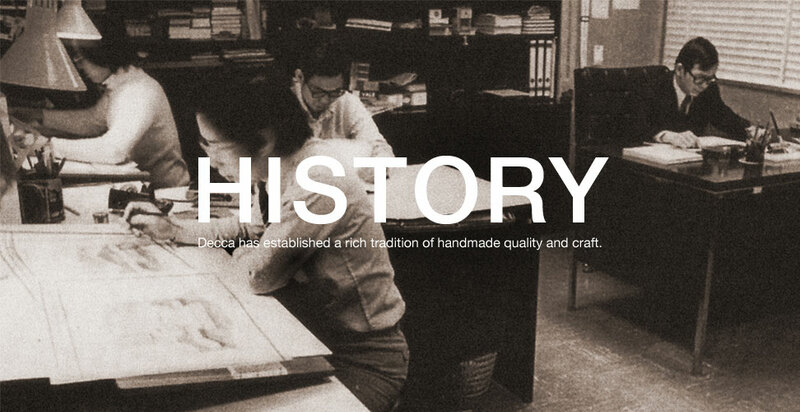 Decca ceases to operate as a subcontractor and establishes its own furniture manufacturing and woodworking department. The company acquires premises in Quarry Bay, Hong Kong, enabling Decca to carry out off-site production and consequently, to exercise greater control over quality and costs. Expanded manufacturing facilities enable Decca to centralize operations and manufacture all wood components for architectural woodwork and furniture. In the mid-1980's, Decca wins large-scale hotel projects in China and Macau. Decca also develops an ongoing relationship with Takashimaya. Decca introduces a central sawdust collection system, a step that signals the company's commitment to environmental responsibility, which becomes central to its policies and practices. Spatial constraints and the lack of skilled labor restrict growth, leading to Decca's decision to establish a major manufacturing facility in China. Decca acquires a 20,000 square foot factory in Dongguan, China. The Group's leadership decides to concentrate manufacturing in China, moving operations to facilities that now comprise 150,000 square meter - much larger than its Hong Kong site. The company establishes its own metal department in China, gaining control of quality, costs and delivery. In the U.S., Decca enters into an agreement with HBF to manufacture office furniture for the Asian market on its behalf. In the mid-1990's, Decca sees an increase in work outside of China and Hong Kong. Its business begins to expand to Europe and the United States. Decca opens its first showroom outside China and Hong Kong in Singapore. Singapore promises to be a strong market for HBF office furniture. With a focus on growing its presence in China, Decca opens a showroom in Beijing. Decca Ltd. is listed on the Hong Kong Stock Exchange following a financial restructuring to support expansion of the business and the growth of sales. Decca Hospitality is established to enter the hospitality furniture market in the United States. Bolier & Company is established to launch Decca's first collection of residential furniture in the U.S.
Decca Contract is established and the company debuts its first collection of wood casegoods furniture. The Decca Contract office and showroom are located in Dallas, Texas. Almost simultaneously, Decca opens an office in Copenhagen and also employs a sales representative in Paris. Decca formally establishes a presence in Europe based in Copenhagen with registered branch offices in London and Paris. Decca acquires Paraworld Furniture Co. Ltd., based in Thailand. In recognition of its strict standards of quality, Decca receives ISO9000 certification. The year marks significant achievements in sustainability. Decca qualifies to manufacture FSC®-certified products and also achieves Greenguard® certification for low-emitting furniture products and materials. China experiences unprecedented economic growth and Decca sees an increase in the demand for high-end furniture. A new showroom is opened in Shanghai. Decca Contract Furniture opens a showroom in New York City, the largest market for office furniture in the U.S.
Bolier & Company opens a new showroom in New York in January of 2011. Decca is restructured and privatized in January, thereby creating greater flexibility and management control for future development of the company. In March, Decca opens a showroom in Bangkok, Thailand. Decca proudly celebrates 40 years of success and remarkable growth on 2 November 2013. Decca expands its product portfolio by introducing the Élan brand to address increasing need for versatile lounge furniture across the contract, residential and hospitality markets. Decca establishes Decca Home to manage the new Rottet Home Collection and Élan by Decca. Building on its success as an internationally acclaimed supplier of furniture and architectural millwork, Decca continues to advance new frontiers by embracing new markets and acquiring high-end projects around the world.